On a night when Galaxy star Zlatan Ibrahimovic conjured up yet another magical strike, Toronto FC celebrated just staying alive for another day. 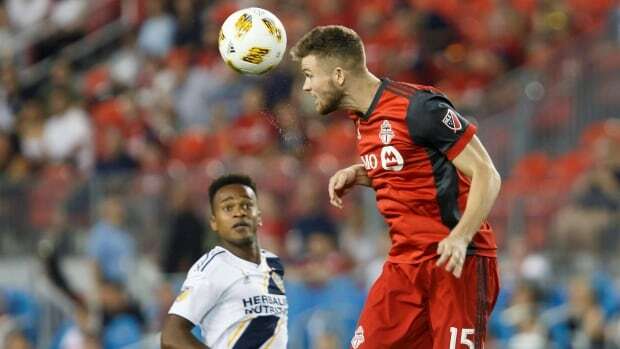 Toronto survived a three-goal collapse and Jonathan Osorio's 75th-minute winner rescued the MLS champions, helping TFC to a desperately needed 5-3 win Saturday over Los Angeles. Jay Chapman added an insurance goal in stoppage time to cap a wild night. "Everything was on the line and there was only one result that was going to work for us," said TFC captain Michael Bradley. "Not perfect by any means but at this point, we're not necessarily looking for perfect." A tie might have sounded the death knell to Toronto's slim playoff hopes. But Osorio, as he has done all season, stepped up when needed and headed home a Marky Delgado cross for his 10th of the season. But coupled with Montreal's 4-1 win over Philadelphia, Toronto (8-14-6) remains nine points out of the playoff picture with six games remaining. Ibrahimovic scored career goal No. 500 to trigger a Galaxy rally that silenced the BMO Field crowd of 30,799 after Toronto raced into a 3-0 lead. The 36-year-old Ibrahimovic has a flair for the dramatic and he did not disappoint in notching his 43rd-minute milestone goal. The play started with Jonathan dos Santos chipping the ball into the box. The six-foot-five Ibrahimovic twirled to get an angle at the ball between two defenders, flicking his right leg up high — in a roundhouse kick more common in mixed martial arts than soccer — to deflect it past goalkeeper Alex Bono for his 17th of the season. "That was a pretty unique finish," said Bono. "I've never had a goal scored on me like that before." The stylish Swede joins Barcelona's Lionel Messi and Juventus' Cristiano Ronaldo as the only active players with 500 goals for club and country. "Instinct," Ibrahimovic said of the acrobatic goal. "I mean those things you don't plan. It's impossible to plan. The way it came, I just tried to get it on goal." "I'm just happy for the Toronto fans that they got to see something they hadn't seen before," he added in typical Zlatan fashion. Given the two teams had conceded 106 goals between them this season prior to Saturday, there was no shortage of offence on show. It was a wide-open affair that could have produced 10-plus goals with Toronto outshooting Los Angeles 17-10 (8-6 in shots on target). Victor Vazquez, Jozy Altidore and Sebastian Giovinco also scored for Toronto, which led 2-0 after 22 minutes and 3-0 after 36. Ola Kamara and Rolf Feltscher also scored for Los Angeles (10-11-8), which beat Bono twice in five minutes early in the second half to tie it at 3-3. The game saw 10 yellow cards issued, six to the Galaxy and four to Toronto.